Well here we are, another year, another huge weekend for Horse Racing fans. The Grand National at Aintree in Liverpool has been running for over 170 years, and is without a doubt the most popular racing meet in history. Over its long four day weekend, it’s estimated that over 600 million people are set to watch the event globally, and a whopping 150,000 fans showing up in person to attend. With the festival just around the corner, we’ve got this brilliant quiz to help you dial in your knowledge this year. All you need to do is read the stats of each anonymous horse and guess which horse it is! The stats range from age, origin, important wins and even trainers. Hopefully it’ll help you figure out the best Grand National Betting offers this weekend. Who’s your money on? D’you think you’ll do well? Let us know, and best of luck readers! The 2018 Cheltenham Festival was an epic event which saw the favourites live up to the billing while they were a few underdogs who managed to make some surprises. The only downside of the event was probably the death of at least five horses both during and subsequently soon after the Cheltenham Festival, something which has prompted the authorities to launch an investigation into the matter. Besides this rather unfortunate turn of events, everything else was smooth and punters who managed to go to the Festival and those who placed their bets online at various sportsbooks such as NetBet Sport were thrilled at most of the favourites won. The last day of the Festival provided the bulk of the action, let’s relive some of the action. The Gold Cup epitomised this year’s Cheltenham Festival’s brilliance and style as the top horses all fought resolutely for the ultimate prize. In a race that was widely awaited for by many, the Gold Cup did not disappoint as Native River won the prestigious Gold Cup in stunning fashion. The favourite before the start of the race Might Bite had to settle for second place despite putting in the performance of a winner. The Gold Cup which also presented Might Bite’s trainer, Nicky Henderson with the opportunity to record a first Cheltenham Festival treble ended in disappointment as Henderson’s horse, Might Bite could only manage second place. Nicky Henderson’s previous two wins were in the Champion Hurdle with Buveur d’Air and the Champion Chase with Altior. With favourites, Minella Rocco, Shantou Flyer, and Double Shuffle ruled out for this year’s Cheltenham Festival, Might Bite’s task was made a little bit easier. However, Might Bite paid dearly for a slow start which allowed Native River to get on the front from the word go, a position Native River maintained for the entirety of the race. 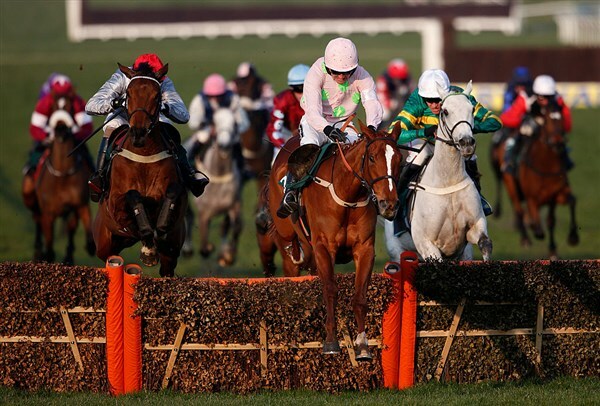 The penultimate race of the Cheltenham Festival saw some top horses battle it out in the Grand Annual. The two-mile handicap chase which is a test of stamina and speed was full of action from start to finish. The race was made much more intriguing by the fact that there was no clear favourite before the start. Last year’s winner, Rock the World though competing again was not tipped by many to retain the title. North Hill Harvey, Don’t Touch It, Theinval, and Vanietux were some of the horses with favourable odds at the start of the race. At the start of the race, Bright New Dawn took the lead and showed incredible pace as he tried to establish a wider gap between him and the other horses. However, the fast start was halted a bit when he failed to negotiate some jumps and Gino Trail took the lead. It was only after some leaps that Bright New Dawn came back into the thick of things. With Gino Trail leading by two lengths, last year’s winner North Hill Harvey fell at the third last. A few lengths before Gino Trail could claim his first Cheltenham win, Le Prezien took a great leap and overtook Gino Trail to finish the race in pole position leaving Gino Trail having to contend with second place. 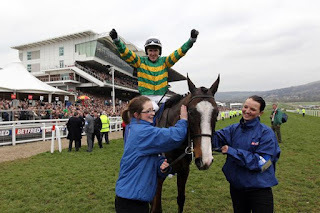 Le Prezien which was being ridden by Barry Geraghty gave him his second win in three races at the 2018 Cheltenham Festival. Trainer Nicky Henderson started the week with 39 Cheltenham Festival winners, just one behind the late Fulke Walwyn but, by Friday evening, was far and away the most successful trainer in the history of the meeting. Henderson saddled seven winners, two more than the previous record held by Paul Nicholls, including an unprecedented four on the second day, to finish the week with a career total of 46 Festival wins. Perhaps the most poignant of the seven was Bellvano, who beat stable companion Tanks For That by 2¼ lengths in the closing Johnny Henderson Grand Annual Chase to give the Lambourn trainer a 1-2 in the race named in honour of his late father. Interestingly, Henderson Jnr. saddled the winner of just one ‘championship’ race, Finian’s Rainbow in the Queen Mother Champion Chase, but victories for Sprinter Sacre in the Racing Post Arkle Chase, Simonsig in the NIM Novices’ Hurdle, Bobs Worth in the RSA Chase and Riverside Theatre in the Ryanair Chase were sufficient to make Barry Geraghty the leading jockey at the Festival for the second time in his career with five winners. Not even Henderson could stop Quevega or Big Buck’s completing hat-tricks in the David Nicholson Mares’ Hurdle and Ladbrokes World Hurdle, respectively. Other notable winners included Rock On Ruby in the Stan James Champion Hurdle, Champagne Fever in the Weatherbys Champion Bumper and Synchronised in the Betfred Cheltenham Gold Cup.